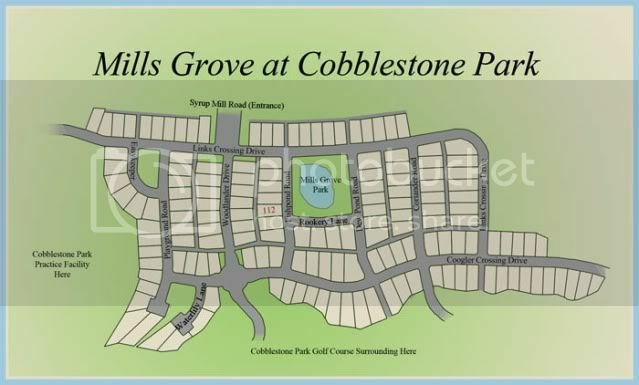 Mills Grove is a section of Cobblestone Park that fronts on the west by Syrup Mill Road, Blythewood, and the south by Cobblestone Park’s initial phase named Longstreet Place. Entering from the main gate on Blythewood Road (just off of I-77 exit 27) you will take your 1st left and pass through Settlement Point, then through Longstreet Place before entering into Mills Grove. Mills Grove is a promising section for new home construction in the 700-acre resort style development. Mainly, because all of the lots are improved with sewer, water, cable, gas, underground electrical, and the second of the three entry gates enter directly into Mills Grove from Syrup Mill. Longstreet Place is almost built to capacity with new homes and the next step should be crossing into the Mills Grove phase. Mills Grove, like Longstreet Place, is subdivided into roughly 8000 SF lots with paved roads and alleys entering into both sides of the parcel. Many of the lots for sale in Mills Grove are cleared, level and ready for construction. If you’re lucky, you may find a waterview lot for sale overlooking the Mills Grove Park. The Park has a black-water pond, sidewalks, and is ideal for an afternoon siesta in the shade under the mature hardwood trees. The entire phase of Mills Grove is in the Richland 2 School District (commonly referred to as Richland 2) and students will currently attend Bethel –Hanberry Elementary, Blythewood Middle, and Blythewood High School. Blythewood is desirable because of the convenience to Columbia, Fort Jackson, and Charlotte. Several Hospitals like ‘Palmetto Health Richland’, The ‘Veterans Administration’ and ‘Provenience Hospital’ are within 10-15 minutes. There are also several popular malls such as The Village at Sandhill, Columbiana Mall, Columbia Place, and Richland Fashion Mall. Cobblestone Park is desirable because of the 27-hole golf course, high-end tennis facilities, and many other amenities. Most of the homes in Cobblestone Park are quality built Charleston style cottages with waterfront or golf course views. For more information you may click Cobblestone Park Real Estate or get more information about Cobblestone Park on our Blythewood Real Estate Blog or search for homes and lots for sale in Cobblestone Park Blythewood.